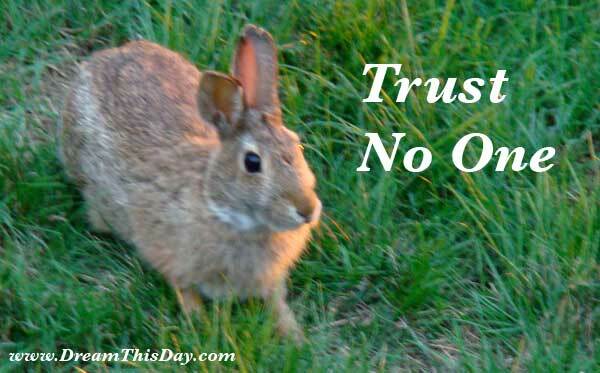 It may seem cynical to say, "Trust No One," but it can actually be a reassuring and positive thought. I am not presuming that others wish you harm. A few may and most don't, but that's not the issue here. For the purpose of this discussion, let's assume that everyone has honorable intentions, and is not doing anything self-serving. Let's further assume that they have your best interest at heart and are volunteering to help you with no consideration of benefit to themselves. This is a bit of a stretch, but it sets the stage for the real point. In their most generous moments, people are attempting to provide you with what they think is best for you. That's a problem. Have you ever been happily curled up on the couch on a Saturday afternoon when there was a knock on your door and several cheerful and enthusiastic people offered to show you their way to achieve salvation? They sincerely believe that they know what is best for you. Apply this thought to everyone in your life from the life insurance salesman to your mother. Under the best of circumstances, they sincerely want to provide you with the advice that they believe will enable you to live the life that they think you should. Disregarding any doubts of their sincerity and ability, the question becomes whether you choose to live the life someone else wishes for you. As I have said before, Conscious trust is one of the underpinnings of a great life. However, what I am asking you to consider today is the difference between trusting someone's intention, and trusting their ability to know what is best for you. In the example above, I TRUST that the visitors at my door want the best for me (unless that trust is broken). What I don't trust is that they are a better judge of how I should live my life than I am. Many of us have been conditioned to trust others' opinions more than our own, and I believe that sort of trust is excessive. This is especially true with regard to authority figures - doctors, lawyers, priests. I trust my doctor's intentions toward me, but I don't blindly follow his suggestions without checking other sources also. He was trained to prescribe a pill for everything, and does it with the best of intentions, but I often choose to trust God's quiet voice inside me rather than my doctor's medical advice. It is impossible for anyone to advise you on anything without presuming that they know what you should want. For example, this article is prompted by my belief that you should want to make your own decisions about your life. But don't trust me on that, it's your life. Don't decide who to trust, decide which ideas to trust. Have TRUST in God, TRUST in YOURSELF and No BLIND TRUST in anyone else. And, in a way, don't even trust yourself. The mind is often conflicted. Be conscious of trusting only your higher self. I have taught a Bible Study for 2 years on a 5 word Psalm (37:3). I believe the entire seminary education can be taught with these 5 words. Now that's comprehensive! The five words: "TRUST GOD AND DO GOOD!"